Despite the current initiatives to upgrade the stock of the native or Philippine carabao aimed at improving its milk and meat production potential, there are still farmers who don’t subject their animals to these initiatives for the purpose of sustaining niche markets in their areas. Customers in these niche markets prefer milk from native carabaos. In the province of Bohol, the “Progreso Women and Workers Multi-Purpose Cooperative (PWWMPC)” sees to it that they continuously raise female native carabaos. They want to have a continuous flow of what they consider to be the native carabao’s “special milk” to satisfy the demand for making “milky bread” products. With the implementation of the Dairy Enterprise Program being supervised by the Philippine Carabao Center at Ubay Stock Farm (PCC at USF) and the local government units of Alicia in partnership with the provincial government of Bohol, the PWWMPC, with its 150 members, was encouraged to go on with its avowed mission as it is seen to be of help to the marginalized farmers. According to Vicente Duetes, dairy technician and milk collector of the coop, although he collects the milk harvest of the members from their native carabaos and crossbreds, he sees to it that the native carabao’s milk is placed in separate containers. 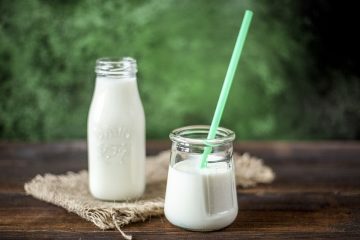 He knows fully well that a big number of consumers prefer it for their processed raw milk and milk products. For their milky bread, the milk is mixed with the flour instead of water and processed into 10 different kinds of breads. These products include ensaymada, cheese breads, Spanish bread, and pan de coco, which he said sell like the proverbial hotcakes. Duertes said the coop members raising native carabaos produce an average of 1.5 liters of milk a day. The coop buys the milk for Php45 per liter, and on the 15th and 30th of the month, pays the farmers for the accumulated total value of the milk they turn in. As the coop is also engaged in food catering, it makes sure that their best selling milk products are included among the food served. “We are certainly getting [a] higher income than before,” Duertes said. 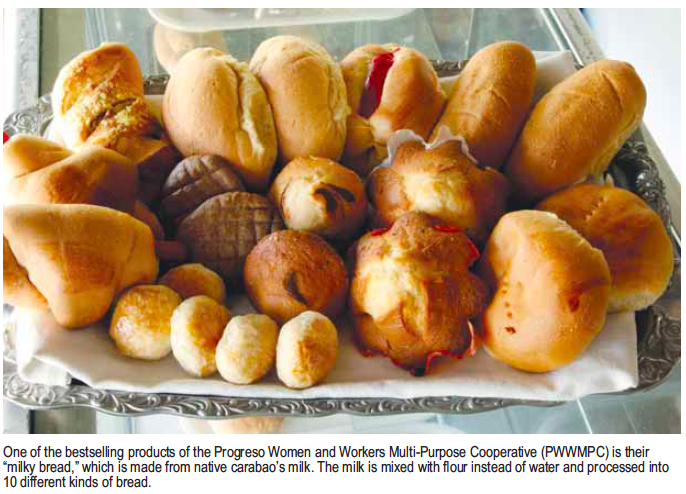 As of March 2014, the gross income of the PWWMPC for their dairy business was Php43,327.10, of which the income revenue from their bakery was Php32,401 (75%). The coop is also doing well in their other business engagements. Two coop-members of PWWMPC narrated the stories behind their dairying ventures. Wilfredo Miflores of La Hacienda, Sitio Dagohoy, Alicia, in Bohol started milking his native carabaos in December 2014. He currently has six native carabaos: two are lactating, three are calves, and the other is a bull which he uses for draft purposes. He collects an average of three liters daily from his lactating carabaos, making an average of Php3,000 a month from the milk. “The income from my lactating native carabaos helps me provide [for] some of the needs of my family,” Miflores said. Imelda Acaso of Putlongcam, Alicia, Bohol, considers milking the carabaos a family bonding activity. Together with her husband Felix and son Johnfel, she milks their two native carabaos every morning at 6 AM. They collect an average of one liter per carabao. They underwent proper management and milking techniques training conducted by PCC at USF. The Acasos, however, don’t own the native carabaos; they serve as caretakers of these on behalf of a cousin who owns them and who offered them a sharing scheme of 75% (for the Acasos)-25% (for the cousin) from the milk sales. According to Floriano Bernales, an agricultural technician of the PCC at USF, they have model dairy farmers for each of the municipalities in their area to encourage people to get into dairying, whether for native, purebred, or crossbred carabao dairying. “We make sure that the farmers [first] know how to [properly milk] their native carabaos before we lend them purebred dairy buffaloes,” Bernales said. He said that farmers’ family consumption of milk has been noted to be increasing as indicated by the number of liters sold. 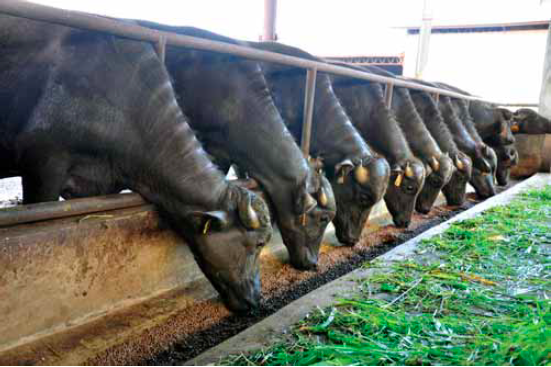 The average consumption is now 28 liters of milk of native and crossbred buffaloes per day from five municipalities of Bohol, which was a big leap from the total volume before. “We know that the farmers here are earning more than Php2,000 [per month] from the sales of milk of their native carabaos alone,” he added. As a big boost to the dairy enterprise in Bohol, the Department of Social Welfare and Development (DSWD) transferred a Php10 million starter kit training fund to the PCC at USF for the development of a Pilot Dairy Commodity Cluster Model Project, to be carried out under the DSWD’s Sustainable Livelihood Program (SLP). The DSWD provides the funds for the starter kit training on dairying for 600 beneficiaries in Bohol. Aside from the fund, DSWD is also responsible for the validation of the eligibility of the SLP beneficiaries. On the other hand, PCC is responsible for the procurement of 600 native carabaos as the basic resource for the starter kit training, validation of the compliance of the recipients with dairying requirements, and the provision of technical assistance and forage development. “The beneficiaries should have [an] area for milking and forage, [an] interest in raising [carabaos], and [an] animal shed. We will procure native carabaos for crossbreeding either through artificial insemination service or the bull loan program. We will distribute the carabaos in six municipalities and [we hope] that each [municipality] will get 100 carabaos,” Bernales explained. Aside from the DSWD fund, the Bohol provincial government, headed by Gov. Edgar M. Chatto, has provided a counterpart fund of Php916,500 to insure the animals for one year. “We recently had a meeting with [Undersecretary] Emerson U. Palad and it was agreed that the government will provide funds for the milk feeding program here, which is expected to be implemented this year. A budget of Php13 per child was allotted,” Bernales said. “Under the plan, each child will be provided with 150 milligrams (mg) of milk costing Php10, he said. The remaining Php3 is for…milky bread, [which will also be given] to the child,” he added. Bernales emphasized that later on, the center will organize cooperatives with a pure stock of native carabaos in CPG Bohol for the Native Carabao Development Program. In Gandara, Samar, the farmers are milking their native carabaos to sustain the needs of the niche market for “keseo,” a kind of cheese. The newly established Keseo Processing Center in Gandara makes sure that there is always an available supply of the much sought-after “keseo” (also known as Queseo) by Samarnons (folks from Samar province). There is a big demand for this kind of cheese in the area. Under the administration of Gandara Mayor Eufemio S. Oliva, with help from partners and the Department of Trade and Industry (DTI), the processing center for Keseo was established to cope with the increasing demand for this local cheese. Operated by the Gandara Keseo Producers Association (GKPA), the processing center, situated in Barangay Natimonan has at least 45 members. Municipal Agriculture Officer (MAO) Adelfa U. Gabejan said that the center is expected to further develop and upgrade the keseo industry in the area in terms of processing, packaging, promotion, and marketing of the product. Nilo Armamento, 49, a member of GKPA, has been engaged in dairying for five years now. He is not selling his harvested milk; instead, his family processes it into keseo. He has five carabaos: three are females of the native variety, one is crossbred, and one is a bull. He collects two liters of milk from his lactating carabao. His wife Joven processes this into keseo “circles” 63 millimeters (mm) in diameter. “We [earn] at least Php300 every day from the sales of 50 keseo that we produce. We have…regular buyers for our product,” Joven said. ”Keseo” is also a much-liked delicacy in the Poblacion of Compostela in Cebu. The Compostela Market Vendors Multi-Purpose Cooperative serves as the market outlet for dairy products from the PCC at USF. One of the suppliers of queseo and carabao’s milk to the town is Nenito Perales, 72, who has been into carabao raising and dairying for 50 years. He collects 1.5 liters of milk from each of his native carabaos. In San Antonio, Lalo Cagayan, one of the delicacies produced and sold in the market is milk candy made from the native carabao’s milk. 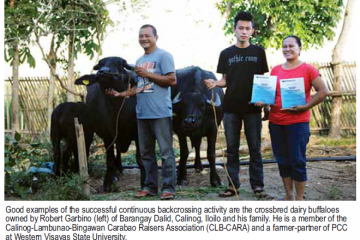 According to Jinnifer C. Puerco, chairperson of the San Antonio Dairy Carabao Raisers Association, the PCC at Cagayan State University encouraged them to try their luck in dairying. “Some PCC [representatives] visited and encouraged us to form an association…then helped us [organize] and make it operational. They provided us [with training sessions] on social preparation, basic leadership, forage production, dairy, and proper milking,” he said. Their association was established in November 2013 with 27 active members. 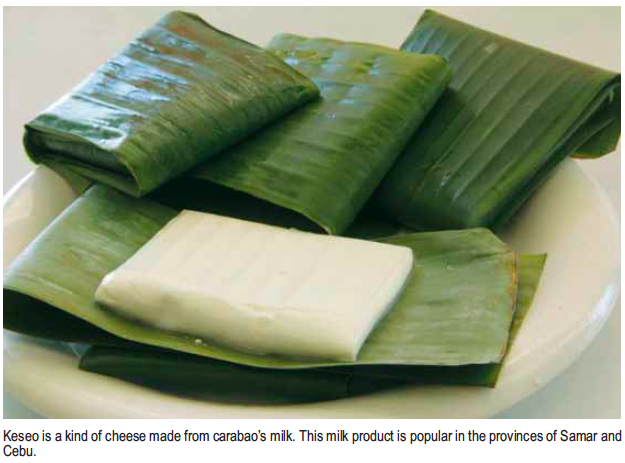 “The native carabao’s milk used for the production of milk [candy] in our town [only comes from] San Antonio,” he added. Since beginning to raise carabaos in 2005, Jinnifer now owns eight native carabaos. Romeo Conseha, 62, milk collector and deliveryman since 2002, said he buys the milk at Php13.50 per bottle (the milk is sold in recycled gin bottles that can hold 333 ml) from 23 farmers and sells these at the town’s market. Other entrepreneurs in the market also produce milk candy from this. The association gets a share of 50 centavos per bottle from the milk collected and accumulates average earnings of Php2,000 quarterly. Its current capital is more than Php30,000. Bienbenido Conseha, 55, is one of the members of the association who provides milk to Conseha. He collects 2 liters of milk from his two lactating carabaos; this is equivalent to nine bottles. His milking activities start at five in the morning. He is currently raising eight native carabaos, five of which are females, two are calves, and one is a bull. “I can’t imagine living my life without my carabao. My life [practically] revolves [around] raising carabaos,” he said. 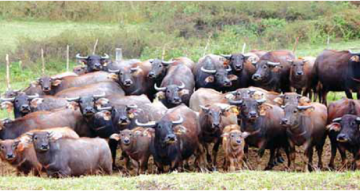 According to Conrado Dupaya, barangay captain, there are more than 200 native carabaos in their place. He believes that life in their area became easier thanks to the animals. 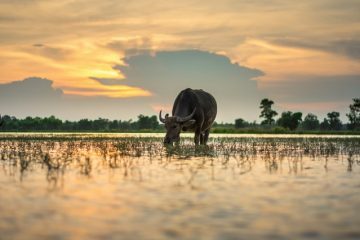 Certainly, as can be seen in the testimonies of the farmers and entrepreneurs, the native or Philippine carabaos have beneficial roles among rural farming communities. It is because their products are sought after in their own niche markets.